Anthony Shave Gel is a light-weight shaving lubricant that protects the skin as you remove the hair. This shave gel leaves the skin hydrated and nourished, and is best suited to those who shave daily. Anthony Shave Gel is easy to apply and doesn't clog your razor blade. 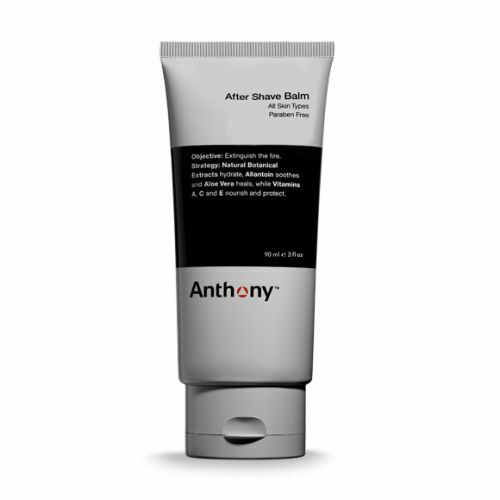 You can also apply a thin layer of Anthony Logistics Shave Gel to the face after shaving as a post shave recovery mask. Aqua (Water, Eau), Glycerin, Oleth-20, Propanediol, PPG-5-Ceteth-20, Carbomer, Aloe Barbadensis Leaf Juice Powder, Citrus Aurantium Dulcis (Orange) Peel Oil, Mentha Arvensis Leaf Oil, Rosmarinus Officinalis (Rosemary) Leaf Oil, Eucalyptus Globulus Leaf Oil, Mentha Viridis (Spearmint) Leaf Oil, Ocimum Basilicum (Basil) Oil, Chondrus Crispus Extract, Ulmus Fulva Bark Extract, Ecklonia Radiata Extract, Panthenol, Agar, Aloe Barbadensis Leaf Extract, Cellulose Gum, Hydroxyacetophenone, PEG-12 Dimethicone, PEG-7 Glyceryl Cocoate, Parfum (Fragrance), Phenoxyethanol, Chlorphenesin, Benzoic Acid, Sorbic Acid, Butylene Glycol, Sodium Hydroxide, Mica, Limonene, CI 77891 (Titanium Dioxide), CI 19140 (Yellow 5), CI 42053 (Green 3). Take a small amount of Anthony Logistics Shave Gel, work together with fingers, then apply to cleansed, damp face. Apply enough to coat the beard and take care to use more on areas where you experience more sensitivity with your shave. In a general way, the commands in U.K. happen perfectly. This was the case for this order.